Sometimes it’s worth letting photographs speak for themselves. Below are three photos taken from what is likely the Keystone Hotel of northwest Joplin, essentially a view of Fourth Street heading west. 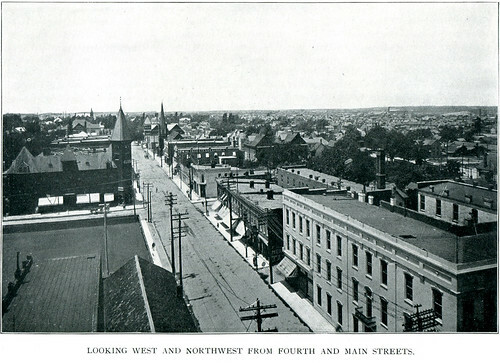 A photo of northwest Joplin, particularly Fourth Street from at least as early as 1902. In the first photo we can see the Club Theater, which is on the left with the steeple at the intersection of Joplin and Fourth Street. On the immediate right, we have the old Joplin Hotel which was constructed like the Club Theater prior to 1900. What is missing is the Miners Bank building which has not yet been built across the street from the Club Theater, as well the new Joplin post office building that was completed the same year as the aforementioned bank in 1905. 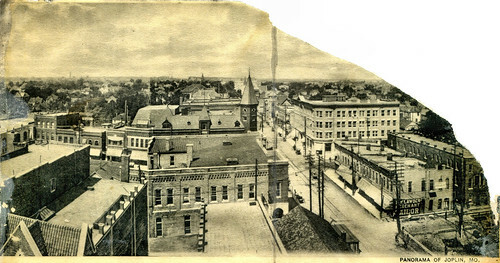 A few years later and there’s a recognizable change in Fourth street and the northwest view of Joplin. Now across the street from the Club Theater is the Miners Bank building and to the right of it on Joplin Street is the brand new Joplin post office. The vacant lot across the street from the Club Theater (the other side of Joplin Street) now has a two story building and laid down the center of Fourth Street are trolley rails. The old Joplin Hotel is still in the right hand corner, but by this time Thomas Connor is likely already planning to tear it down to build a brand new hotel that one day would bear his name. It was demolished at some point in 1906, which helps date this view. Thus, sometime after 1905 and before a point in 1906. If only this photograph was not torn, we might have had a better view of the Joplin of 1906 or 1907. Not much has changed from the last photograph except the absence of the old Joplin Hotel in the lower right hand corner. Instead, we have the beginning excavations for the foundation of the future Connor Hotel. Constant in all three photos are two narrow buildings in the center bottom or left, one with a flat roof and the other with a peak. In a few short years, a seven story building would take their place and might have contributed to the decline of the Keystone Hotel as a popular spot to take a northwest view of Joplin. Thus, in three photos that likely cover a time span of less than a decade, you can get an inclination of the rapid growth of Joplin. Sources: Historic Joplin’s private collection. This page took 0.192 seconds of computer labor to produce.